Although the main river through Yosemite Valley (the Merced) eventually turns south and starts to gain elevation as it enters a smaller, less steep-sided ravine (to Vernal and Nevada Falls), the familiar valley scenery of meadows and flat woodland beneath sheer cliffs does continue several miles further east, along Tenaya Creek - one of the largest tributary streams, this flows through a long canyon starting near Tenaya Lake on the Tioga Road. Paths lead up the lower 3 miles of the canyon, first reaching Mirror Lake, a calm, seasonal pool on the creek that provides beautiful reflections of the enclosing cliffs, then continuing to Mirror Meadow where tall grasses mingle with wildflowers in a large clearing in the pine forest. Mirror Lake topographic map, Yosemite Valley trails. 7 views of Mirror Meadow and Mirror Lake. A loop trail runs along the north and south sides of the canyon floor, while the lake is also reached by a paved road, now closed to vehicles, that meets the easternmost end of the park drive (the section around Upper Pines Campground), though the closest car park is the Trailhead Parking area, 1/2 mile east of Curry Village. The quickest way to see both lake and meadow is to walk along the road then take the north section of the loop trail, a one-way hike of 2.5 miles. The full meadow loop is a 6 mile round trip. 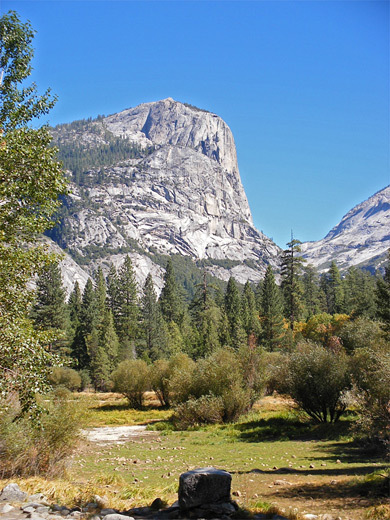 The walking distance to Mirror Lake along the road is 1.6 miles from the Trailhead Parking; past Upper & Lower Pine Campgrounds, and some stables, then through cool woodland close to Tenaya Creek, staying quite level until a short climb towards the end. A path circles around the lake, which is situated directly between Half Dome and North Dome, and has good views to other peaks further up the canyon so is a good place for photography even in summer/early fall when both creek and lake dry up completely. Half Dome and parts of the southeast side of the canyon are in shadow until late afternoon but the views in all directions are very impressive. Mirror Lake still gets plenty of visitors in the dry season, many of whom cycle rather than walk (bikes may be rented from Curry Village and Yosemite Lodge). Not nearly so many hike further east, along the (unsignposted) Mirror Meadow Trail, the north branch of which passes through more shady forest before reaching the meadow after one mile. The edges of the meadow are quite overgrown, and the although the trail does not cross directly, the grassland can be reached by walking through the trees and along fallen logs a little way. The meadow is bordered by green foliage of long reeds and bushes, flourishing in the marshy environment. 0.2 miles beyond is a junction with the Snow Creek Trail, a 5 mile route with the steepest gradient of all paths in the valley, that leads up the side of Tenaya Canyon and across woods to the Tioga Road. For a good perspective over the meadow and the canyon, one needs to hike about 0.3 miles (400 feet up) along the trail, at first through pine woods then manzanita bushes then out onto an open granite slope. After the junction, the Mirror Meadow Trail soon crosses Tenaya Creek and returns to the road along the south edge of the valley, not passing very close to the meadow.